I don’t use chickens. After witnessing years of chickens wallowing in their own feces in small cages waiting to be schechted (slaughtered) for the ritual of Kaparot before Yom Kippur, I gave up on this custom. I once was enamored of this ancient ritual whereby the sins of a person are symbolically transferred to the chicken, which is then slaughtered and given to the poor to eat. It was exotic. But no more. I find it reprehensible for Jews to behave this way to animals. I routinely travel to the places where these chickens are being slaughtered and document the conditions. The laws in Judaism about how to treat animals are being flagrantly violated. Cramped into cages they can’t event stand up in, or in cardboard boxes — yes, cardboard boxes — the chickens are out in the hot sun, without water, wallowing in feces. The entire operation has a smell that is so foul I have thrown-up. 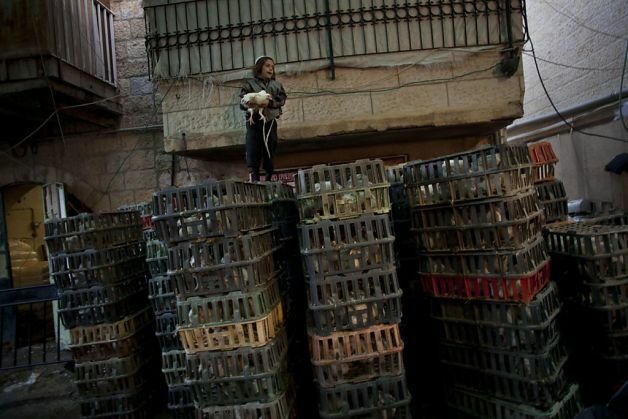 As an Orthodox Jew I speak out that this custom must change.There is no way today to perform this ritual in a humane way, simply because the number of chickens being used for the ritual is so enormous. The rabbis long ago said that the ritual can be done with money. The money is then given to tzedakah. Use the amount that is spent on a chicken — usually about $18 a bird. One waves the money over the head, or the head of your children and recite sthe same verses. There is no difference to how the ritual is performed, except that this is not “A Mitzvah which comes from a Sin,” which is obviously frowned upon. Next we need to talk about factory farming.